Hi peeps! At long last I am back after a brief (too-long) hiatus. To be honest, it’s been a tough month for me and I’ve been feeling exhausted and bruised. I decided that the best way to pick myself back up was to start baking and writing. 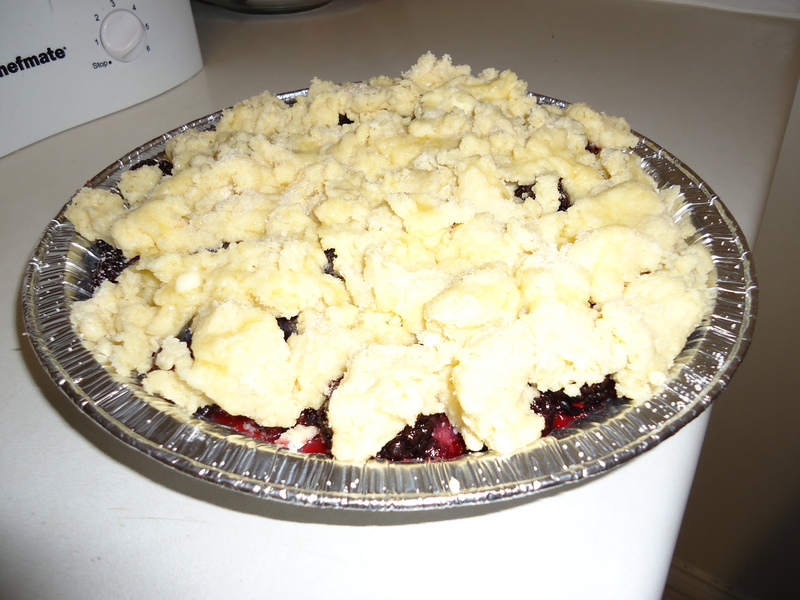 So, at the risk of sounding cheesy, and in honor of the first few days of Spring, I bring you Black & Blue Berry Cobbler. Preheat oven to 400 degrees. 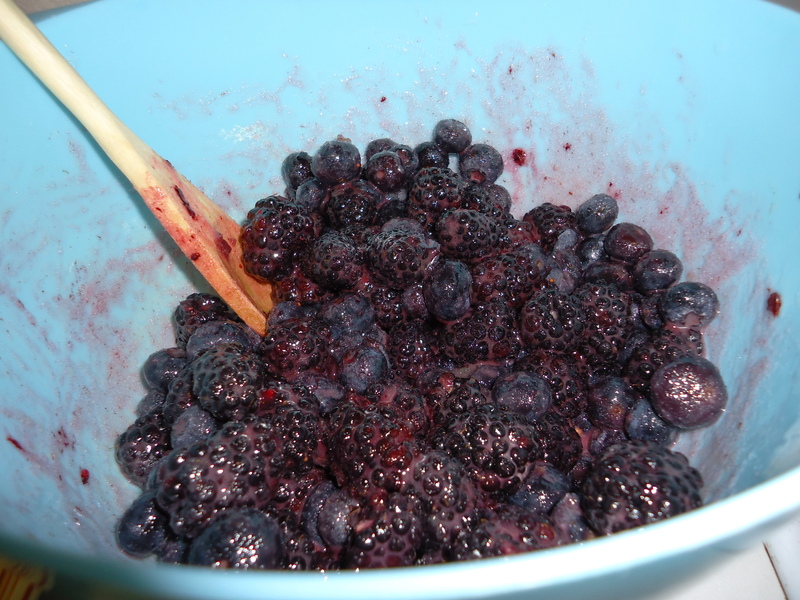 In a mixing bowl, combine berries with sugar, cinnamon, cornstarch and lemon juice. Stir gently to combine. 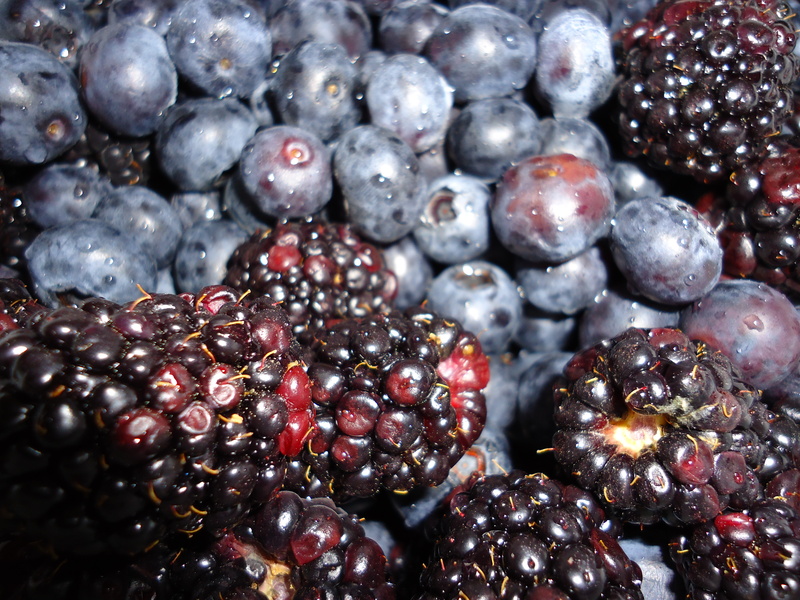 You can feel free to use your favorite berries, these just happen to be my top picks! 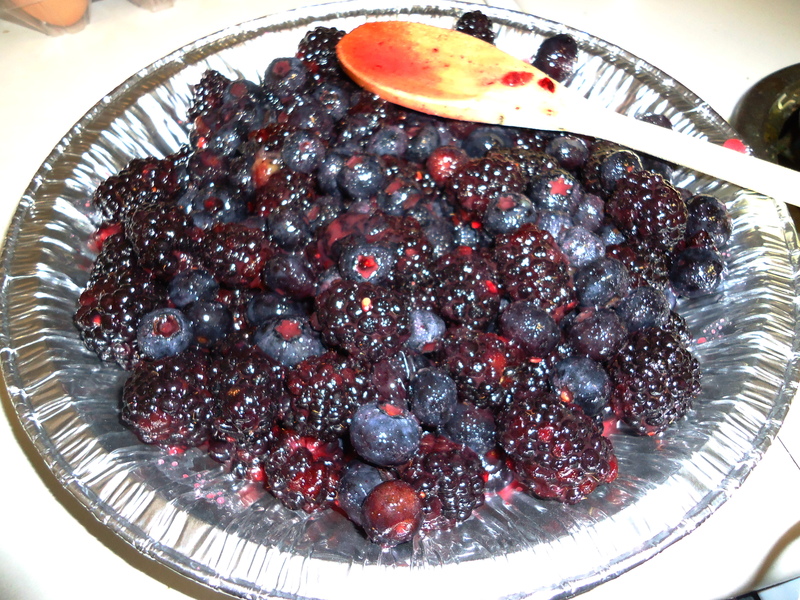 Spread berry mixture into a 10-inch tart dish. If you are like me, you don’t have one of those just laying around. I used one of those foil tins from the grocery store. Easier clean up that way! In a large bowl, mix together the flour, baking powder, salt and sugar. Cut the cold pieces of butter into the dry mixture using 2 forks or a pastry blender. The butter pieces should be coated with flour and resemble crumbs. In another bowl, mix heavy cream and egg together, and then add to the flour and butter mixture. Mix just to incorporate, and be careful not to overwork the dough. 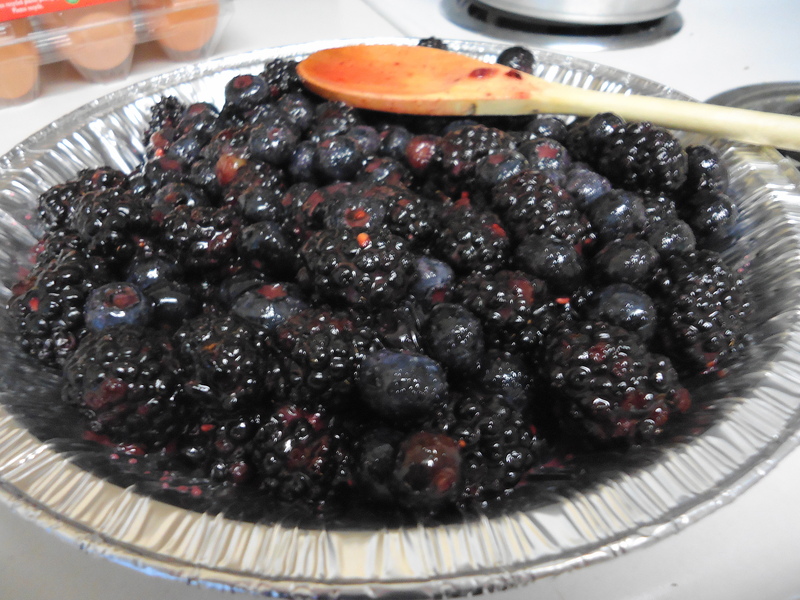 Drop spoonfuls of the dough evenly over the top of the fruit, Make sure to leave a little room around the edges of the tin as the cobbler will spread out. Drizzle the surface with melted butter and dust with sugar. MMM don’t you just want to eat it up already?! Set tin on a cookie sheet and bake for 30 to 35 minutes. 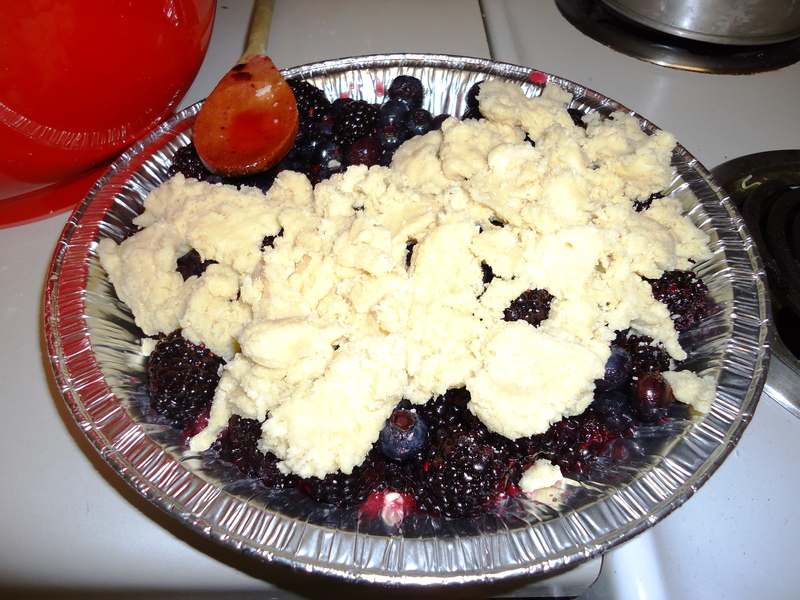 Your cobbler will turn a lovely golden brown when it’s ready. Cool for 15 minutes before serving and serve with whipped cream or vanilla ice cream. Tyler Florence’s recipe actually calls for adding additional blueberries to the scone dough. 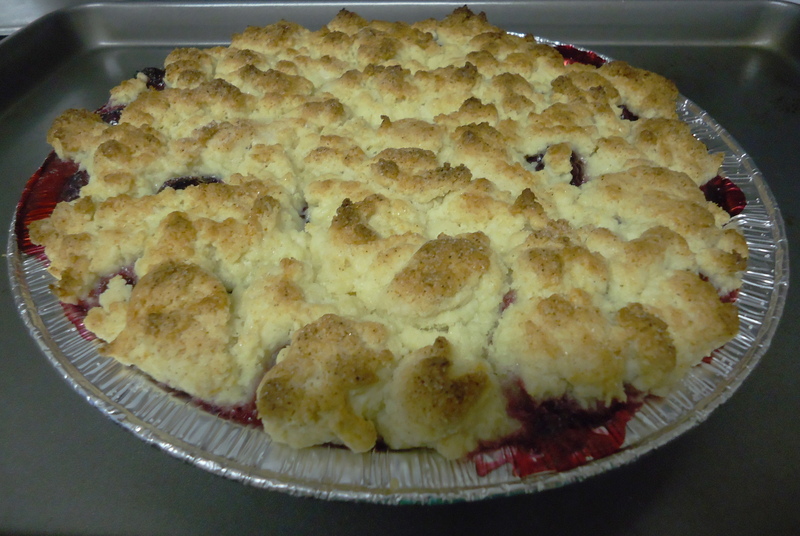 I’m sure that would also be delicious, but I decided double berry cobbler was enough. I had a lot of leftover scone dough, so rolled my the topping into a ball, wrapped it in saran wrap, and tossed it in the fridge. This recipe just keeps on giving, and the dough can be used for awesome fresh-baked scones the following morning! Had some blueberries I wanted to use and felt like it was a baking day. Awesome and easy recipe. Thanks for sharing!